Finding the perfect gift for newlyweds, whether it be an engagement gift, wedding gift or housewarming happy can prove to be quite the challenge! We rounded up some of our favorite ideas from gift cards to the best local eats to personalized kitchenware to home decor. Shop the links below the pictures! This candle from Anthropologie is the best because 1) it smells INCREDIBLE 2) it is beautiful and 3) it’s under $35! Every new wife loves a good cookbook! This sign from Magnolia Market would be the sweetest addition to the bride & groom’s first home. We love these coffee mugs because they go with any style kitchenware! This personalized lazy Susan would be the perfect addition to the bride & groom’s first kitchen. This unique pitcher would be a great addition to a bar cart! It’s hard to go wrong with these acrylic glasses.. never break another wine glass! Since wedding season is so busy for many brides, they forget to print their engagement pictures! Gift them a framed picture for their home. 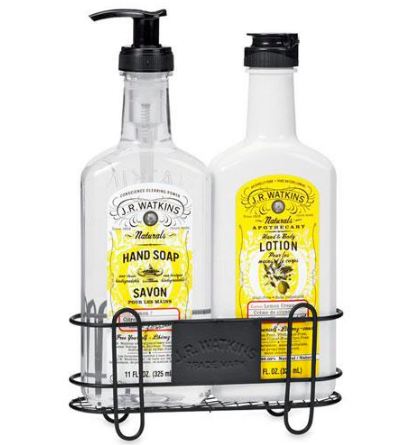 Who wouldn’t love this JR Watkins kitchen soap/lotion pair? It’s available for under $30! Pottery Barn carries this adorable personalized cheese board & it’s under $30! A really personal gift would be a custom painting of the church they got married in. Order a commissioned piece from this Birmingham-based company. We wish our office smelled like this Anthropologie candle all the time! It’s the perfect little gift. Who wouldn’t want a gift card to a monthly wine subscription? For something more along the lines of a housewarming happy, this personalized kitchen towel is perfect! It’s under $10! Another popular pick is a gift card to one of Birmingham’s best! Provide a date night for the couple that will allow them to intentionally spend time together while eating some really good food. Some of our favorite suggestions are: Highlands Bar & Grill, Hot & Hot Fish Club, Bottega, Ovenbird, and Gianmarco’s.